Today’s nail art inspiration comes from the Japanese Blossom, oh and Pinterest. I’ve become a little obsessed with Pinterest, checking it constantly and oohing and ahhhing over pictures. One such picture was of a beautiful Japanese garden with hanging blossoms. Somehow I can’t see myself being able to snag a plane over there anytime soon, so my nails will have to serve as little reminders instead. Now, the base coat I actually mixed the blue and the white together. This was because I don’t own a pale enough blue (clearly, I know what’s going on my shopping list). However if you own a sort of sky blue, paint all over your nails and let it dry. 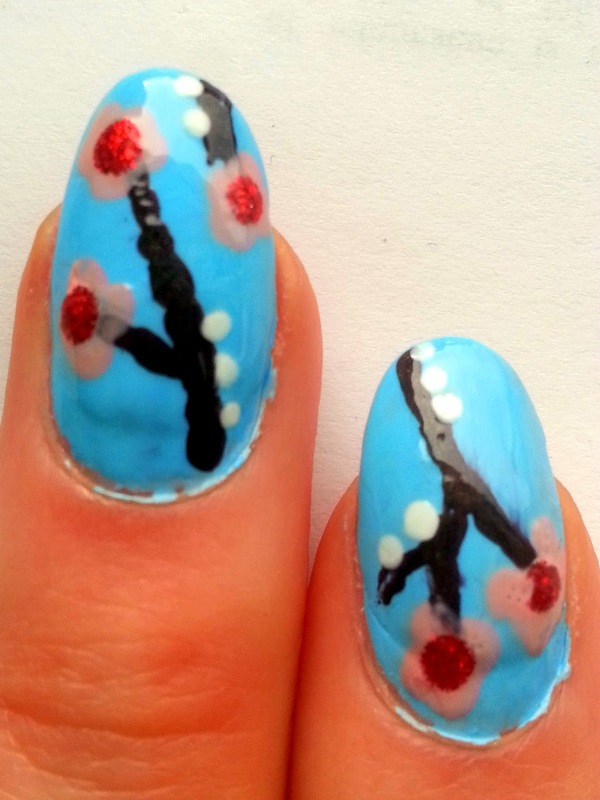 Once dry, using a nail art brush or nail art dotter, draw branch like strokes using Hot Fudge. I did various shaped ones to give different effects. Then using a nail art dotter, dot 4/5 Cotton Candy dots around the end of the branches (think of each dot being a petal). Then dot a red centre of your blossom flower using Red Glitter. Finally taking the white colour, add accent dots at the base of the branches. I’m sorry the photos look a bit... funny today. I’m quite sad they don’t do this nail art half the justice that’s required. I just couldn’t seem to capture them too well. These look awesome! 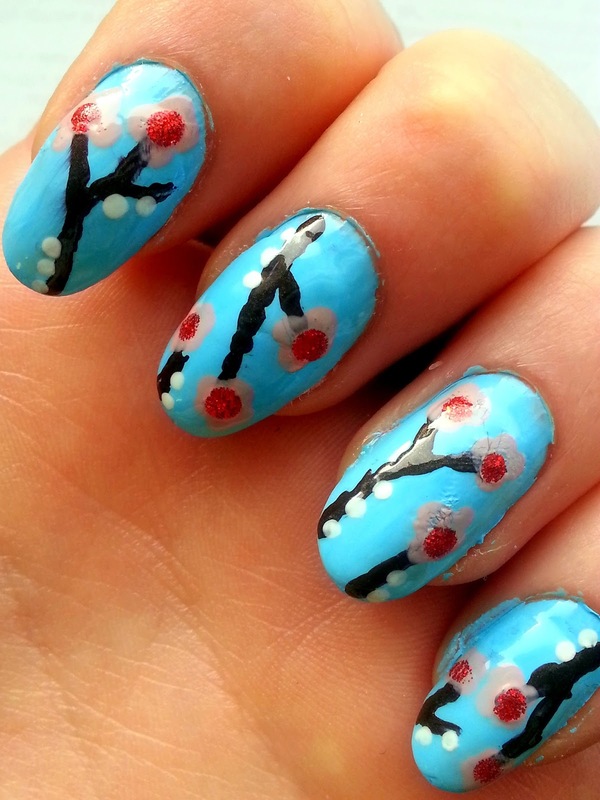 I love pinterest for nail art inspiration! These are gorgeous, wiSh i was this talented!